Republicans see benefits – as well as costs – from legalization. 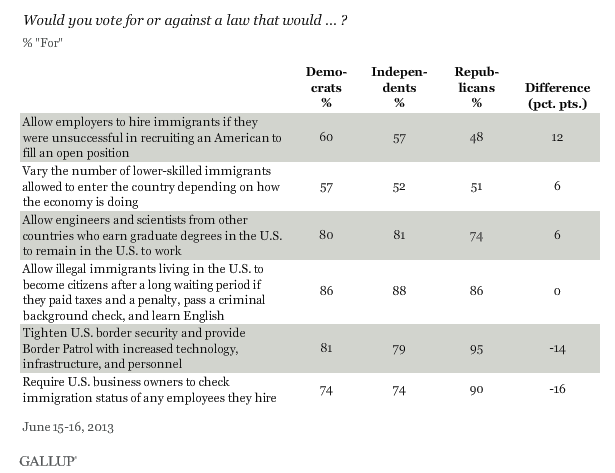 Our June survey found that a large majority of Republicans (70%) think it would be better for the U.S. economy if undocumented immigrants became legal workers. About as many (69%) said undocumented immigrants are “hard workers who should have an opportunity to stay” in the United States.” And fully 76% say it would be unrealistic to deport everyone in the country illegally. As many Republicans as Democrats say they’d vote for a law that allowed unauthorized immigrants to eventually become citizens provided that they first fulfill a list of requirements. A Gallup poll conducted June 15-16 found that 86% of Republicans – the same percentage as that of Democrats, said they would back legislation allowing immigrants living illegally in the U.S. to become citizens after a long waiting period if they paid taxes and a penalty, passed a criminal background check, and learned English. The New York Times noted that polls that describe the many requirements an unauthorized immigrant would have to satisfy before gaining citizenship find higher GOP support than polls that do not mention the requirements in detail, or at all. 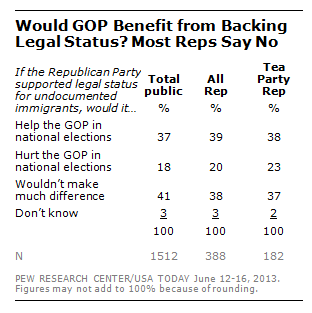 Republicans aren’t sold on the political benefits from supporting immigration reform. Some leading Republicans have said the party’s future prospects are tied to support for immigration reform. Former Florida Gov. Jeb Bush called immigration a “gateway issue” for both Hispanic and Asian voters in a recent op-ed in the Wall Street Journal. 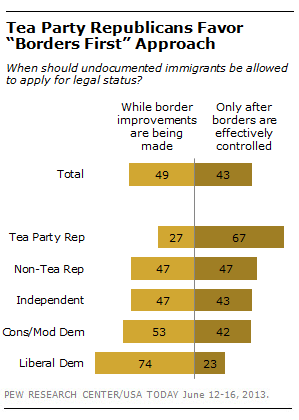 Fully 67% of Tea Party Republicans say undocumented immigrants should only be able to apply for legal status after effective control over the border has been established. Among non-Tea Party Republicans only 47% express this view.